Ministry of Propaganda - 18/Jan/2004: "Detour to reach the goal"
A new word I learned today: Obliquity. It's the word John Kay uses to explain that is sometimes makes sense to take a detour to reach a goal. Or as he puts it: Forget how the crow flies. Fascinating examples from military history, business, building projects and fire fighting (among others) where the direct approach failed but approaching the problem in a "roundabout way" was successful. Very interesting thoughts, not sure yet how useful for me, but something I'll keep thinking about. And another reminder to restart reading The Truth About Markets (I started it but then got distracted). Me playing with my new (?) 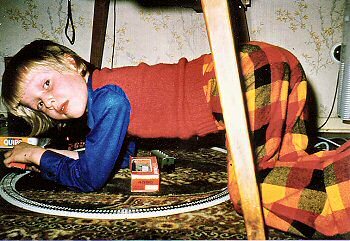 train set at Christmas 1973 or 1974. Love those trousers.